So, what did you think of the Opening Ceremony of the London Olympics? Unlike for the Beijing Games, my dad and I watched the whole thing live on the computer in my grandparents' home in Oregon. Just for good measure, we watched much of it a second time when NBC finally got around to broadcasting it that evening. I've shared my impressions of the production in a guest post for The Displaced Nation. Please take a look and let me know in the comments what you thought of the show! I've been watching as many Olympic events as possible this weekend, but I've discovered that it's very frustrating to look at the news or check Facebook because everyone keeps giving away the results! Are you watching the Games? What's your favorite event? It's finally time for the London Olympics! I've been eating, sleeping and breathing the Olympics over the past two months as I've been spreading the word about my mini travel memoir The Olympics Beat: A Spectator's Memoir of Beijing. Now it's finally time to sit back and watch the Opening Ceremonies on TV. I'll be watching from my grandparents' farm in Oregon and tweeting my thoughts @ShannonYoungHK. Let me know what you think! I also have two new guest posts on some cool book blogs today. The first is about what it feels like to be at the Olympics at To Read or Not To Read. The second is about storytelling and the Olympics at Read That Also. Hi Everyone! I'm writing from my grandparents' home in beautiful Bandon, Oregon. We've all gathered to celebrate my grandpa's 90th birthday. My family members have arrived from Arizona, Colorado, Alaska, Kenya, the Philippines, and of course, Hong Kong. We've gone crabbing, played at the beach, pulled weeds around the house, and eaten lots of big, happy meals together. Coming up on the agenda, we'll be watching the Opening Ceremonies of the London Olympics together. 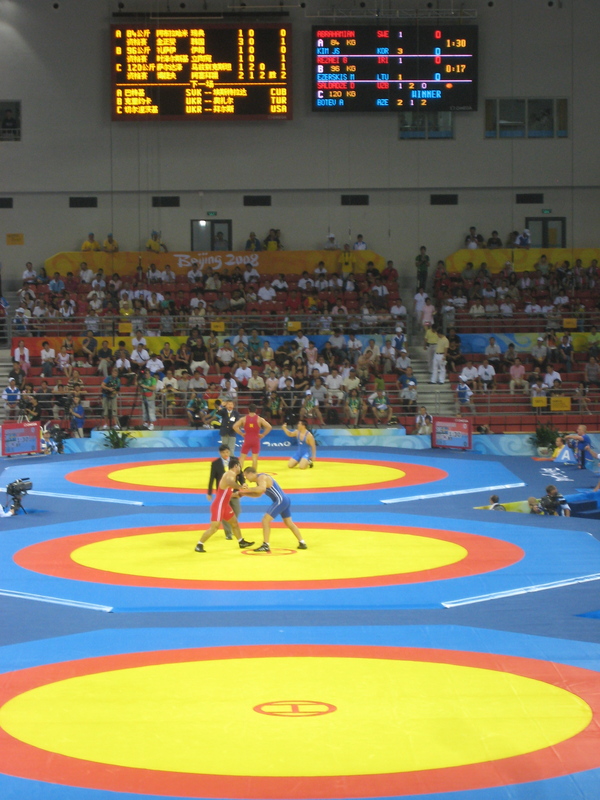 I'm preparing for one final publicity push for my Olympics e-book, The Olympics Beat: A Spectator's Memoir of Beijing. If you'd like to help, you can tweet, Facebook, or even blog one of the links to my book. To learn more about my family history in Asia, check out this interview with Susan Blumberg-Kason. To see all of my pictures from the Beijing Olympics, visit ShannonYoungWriter.com. To read my travel memoir about the Olympics, you can find it for $0.99 on Amazon, Nook and Kobo. There are now 8 reviews on Amazon if you'd like to see what other readers think about it. What are you doing this summer? Where will you be watching the Games? This week, I wrapped up the end of the school year in Hong Kong and headed off to America! Before I left HK, I spotted two people reading Kindles on opposite sides of the same MTR car. I spotted an additional Kindle in Hong Kong International Airport. The woman next to me on the plane was reading The Sunday Philosophy Club by Alexander McCall Smith on an iPad. A gentleman nearby had what looked like a thriller. I didn't notice any other books because I slept for ten of the twelve hours we were in the air! I spent a few days in San Francisco with one of my best friends from college. It seemed like there were a lot of readers around town, but I didn't get a chance to write down many titles. 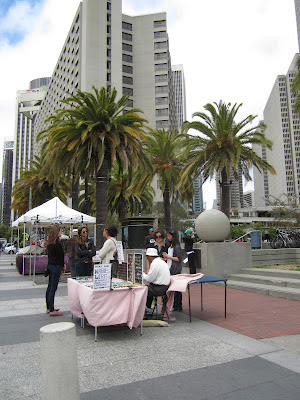 We spent a little time in this lovely bookshop in the Ferry Building. When I made it to SFO, I visited another busy bookstore and spotted a woman reading a book by Anne Tyler and two more e-readers. Last night I arrived at my grandparents' farm in beautiful Bandon, Oregon. The rest of my family is on the way from Arizona, and we'll be spending a glorious two weeks here. Can't believe it has been three years since we graduated from Colgate. This weekend I celebrated my 24th birthday with karaoke and Hong Kong's best Mexican food. It was a nice reminder that I've been lucky enough to find a terrific group of friends in my two years in Hong Kong. One of them showed up to the party with a brand new Kobo e-reader she bought at Swindon Books in Tsim Sha Tsui. It had a pretty lavender cover and she asked that it be included in this week's bookspotting post. It's fortunate that she mentioned it because I didn't spot any book titles this week. I only spotted three Chinese books on the MTR. In other birthday news, my fiance came back from a business trip to London this week with some Olympics gifts for me. 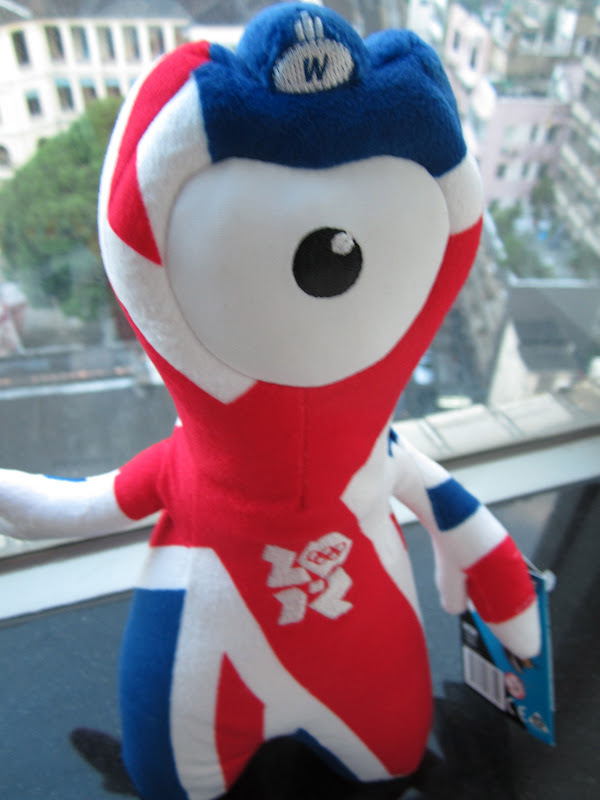 These included Wenlock, one of the London 2012 mascots. Wenlock and Mandeville are meant to be drips of steel from the Olympic stadium. They're a bit scarier than the adorable Fuwa from Beijing, don't you think? In less than a week I'll be heading back to the US for a month, so expect bookspotting posts from California, Oregon and Arizona. What are you all doing this summer? What are you reading? This Sunday was the 15-year anniversary of the establishment of Hong Kong. Hu Jintao was in town, and there were fireworks and protests galore. My friends and I decided to celebrate the long weekend (which also happened to be Canada Day) by going on a junk trip. Junk boats are a favorite expat activity, especially when the weather is as beautiful as it was this weekend. This walking tour doesn't actually involve much walking, but it shows yet another side of Hong Kong life. For me, the day started at the Star Ferry Pier in Central. 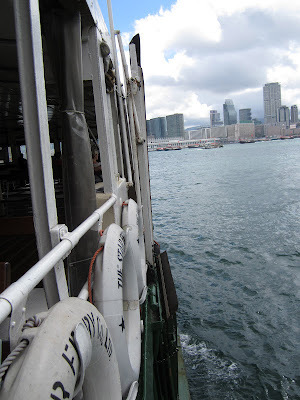 I hopped on the ferry and headed across Victoria Harbour. It was early and the top deck of the Star Ferry was pretty empty. 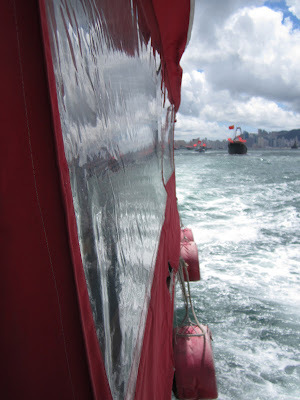 ... and Tsim Sha Tsui. ...and a lone Chinese flag on top. The ferry maneuvered through the boats to dock in TST. ...and a motley crew of friends in sunhats, swimsuits, and sunscreen. ...and set out into the Harbour. ... with plenty of space for everyone. There was also a kitchen and cooler to keep us fortified for the day. 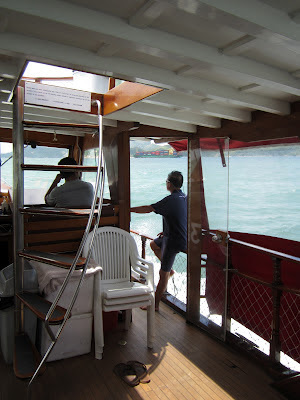 ...and the views of Hong Kong Island. ...and we settled in for the ride. ...and it had lots of nooks and crannies to explore. ...and sailed toward Lamma Island. We ended up in Turtle Cove on the south side of Lamma. There were only two other boats nearby. ...and tried to get pictures every time its tale or fin broke the surface of the water. ...spent a lot of time staring at the shadow moving beneath the water. Another boat arrived and took pictures that ended up in the Apple Daily. We settled in on the roof deck to enjoy the sun without any swimming. Eventually we decided to up anchors and head for a different bay. We settled in here for another swim. Until it was time to head home. For the video of the shark made by a nearby boat, check out my Sharkspotting post.